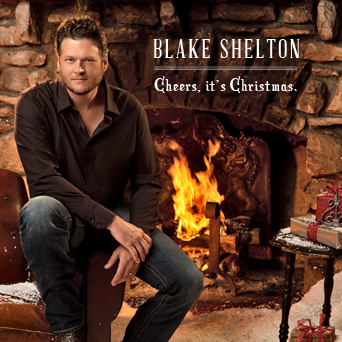 Blake Shelton, the current CMA Male Vocalist of the Year, invited some of his most talented friends to join him on his very first holiday album, Cheers, It's Christmas. Luckily for us, his friends are some of the best known artists from a wide variety of genres.Their creative minds manage to take even the most familiar old standards to a new place with added vim, vigor, and musical passion. This album will quickly get you in the best of holiday moods. It kicks off with the upbeat “Jingle Bell Rock”, featuring vocal harmonies by the very talented Miranda Lambert. This is followed up by a simply beautiful rendition of “White Christmas” of which, I'm sure, Irving Berlin would approve. There are fourteen songs in all, most you will recognize immediately, but among the old standards is a new tune, with simple lyrics and a memorable melody, that is most likely destined to become an old classic. “Oklahoma Christmas” features Shelton's incredibly talented, fellow “OK sooner” pal, Reba. In a sweet yee-haw sound, reminiscent of the best of the old Bob Wills tunes, they merge their voices to encourage you to two-step to “we'll have an Oklahoma Christmas even if we have to have it here in Tennessee.” This is followed up by a really feel-good rendition of “Let It Snow, Let It Snow”. On “There's A New Kid In Town”, written by Keith Whitley, Don Cook, and Curly Putman, Shelton's duet partner is the always amazing Kelly Clarkson. This is a most pleasing and powerful version of this touching song and their voices blend so effortlessly that it's simply beautiful. The follow up song is the fiddle driven, up-tempo tune, “Santa’s Got A Choo Choo Train”, co-written by Shelton, Rob Byus, Beau Tackett, and Tracy Broussard. It goes to the opposite end of the musical spectrum in a most delightful way. Michael Bublé who co-wrote “Home”, with Alan Chang and Amy Foster, joins forces with Shelton to deliver a sweet rendition of this incredibly beautiful song. Shelton goes solo to sing the next two old standards, “Winter Wonderland” and “The Christmas Song” before being joined by the Pistol Annies on another great classic, “Blue Christmas”. The swingin' saxophone gives a subtle energy to this familiar old song. “I'll Be Home For Christmas” was a stand out track for me. It has long been one of my favorite Christmas songs and Shelton sung it so sweetly. He managed to deliver it with heart you could actually feel. Xenia, who was on Shelton's team on the popular TV show, The Voice, demonstrated why she made the team, when she harmonized with him on “Silver Bells”, but it was the follow up track that will leave you feeling like you actually went “home” for the holidays. On the cleverly written, “Time For Me To Come Home”, Shelton has a very special co-writer and duet partner, his mother, Dorothy Shackleford. Perhaps that is why the sentiment of the simple lyrics felt so incredibly genuine. Trypta-Phunk joins him to wrap up the album with “The Very Best Time of Year”. It is a nice ending to what might turn out to be the very best [new holiday album this] year. Shelton said that he has always wanted to do, what he calls, “a timeless Christmas album”. Well, Christmas has come early for him and he got what he wanted. This one is a definite keeper and will, most likely, be one of the best stocking stuffers this season and for many more seasons to come. “Miranda, your voice is home to me. I love you! Reba, you're my hero. I love you! Kelly, you seriously amaze me. I love you! Michael, I can't believe you re-wrote such a personal song for this. I love you (not in a weird way). Xenia, such a unique and beautiful voice. I love you! The Pistol Annies, y’all make me look so cool. I love y'all! Team Blake from The Voice Season 3, you are all superstars. I love y'all! Trypta-Phunk, so cool that we finally recorded together. I love y'all!! Mom, you are my inspiration for this album. I love you!